Swingers Lounge bar MYSTIQUE in Tenerife. MYSTIQUE Lounge bar is for couples and singles. You will find us on the boulevard at Playa de Las Americas. 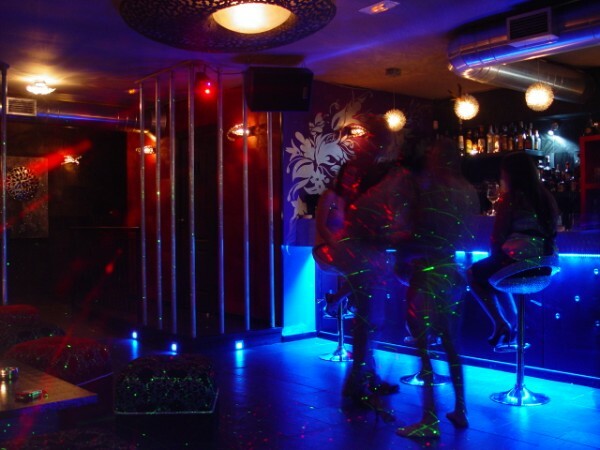 We are the biggest Swingers Lounge bar in Tenerife, and Canarian Islands, with a total of 450 M2. Smoking is allowed in the Loungebar. To the rear of the club there is a private VIP swingers area where you can enjoy the facilities offered including; sauna, 2 private rooms, dark-room, sm-room, French wall and much more. Located outside are 2 large private terraces where you can enjoy a jacuzzi or just relaxing on one of our sofas. Smoking is not allowed in the swingers area inside, only on the terrace. Big beach with sand and stones, 1.150 x 40 m. fine sand, windy beach, high occupancy, is a beautiful bay, bordering the North Sea with the Red Mountain 170 m altitude, in the extreme west of the beach you will find the population of El Medano, surrounded by buildings in the tourist season, there are bars, restaurants, monitoring and alert the local police, showers, telephone, beach cleaning and litter bins. Nudist beache not cultivated, 420 x 30 m of gravel and stones, average occupacion, surrounded by flat land with little vegetation and gardens, away from all tourist populations, no services. Small cove naturist centers were are no buildings, 50 x 8 meters of gravel and stones, and crystal clear water, with average occupancy, surrounded by cliffs with little vegetation and some trees, away from the tourist areas, relatively close, without services. Isolated nudist beach, not cultivated, 410 x 48 m. fine sand, moderate waves, strong currents, high occupancy, surrounded by high buildings and a number of tourist places, in service during the season, monitoring and signaling, such as the Red Cross, clean beaches and rubbish bins.